Recently Xiaomi released the MIUI 7 operating system for the Xiaomi phones. The new MIUI 7 comes with lots of improvements and packed with lots of customization nd features. MIUI 7 is 30% faster than the previous version of MIUI 6. 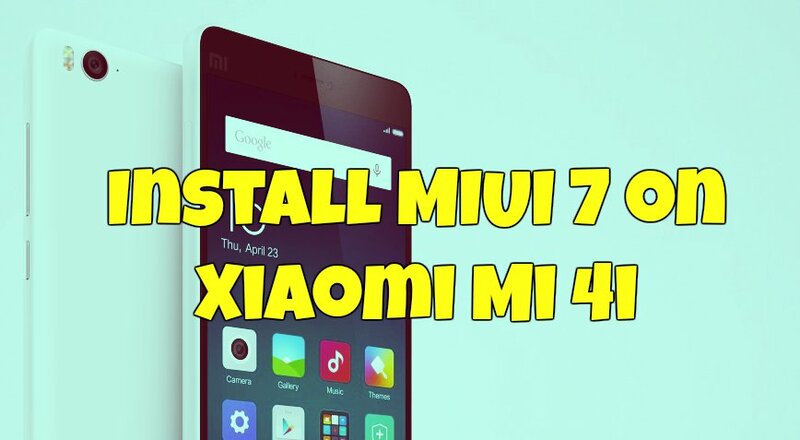 If you are the Xiaomi Mi 4i Phone user and want to try the MIUI 7 on your phone, here is the tutorial which you can follow on your phone and install the same in simple steps. Here we’ll show you how to install MIUI 7 Developer ROM and install the Google apps on the Mi4i phone. All you need a rooted phone with custom recovery and you have to flash two files on your phone, first the ROM and second the Google App package. The process is simple and takes a few minutes to complete the installation process. Before following this guide do take the full backup of the phone like contacts, apps, music, videos, images, and emails. Read our guide here how to take the full backup of android phones. Once the backup is done, read all the below mention instruction and follow them step by step on your phone. Step 1. To get started you need a rooted Mi 4i with custom recovery, check out our guide here how to do that. Step 2. Once the Recovery is installed on your phone, Download the MIUI 7 ROM package here. Step 3. Now download the Google apps package here. You need this package to install all the Google application on your Mi 4i. Step 4. Once both the file are downloaded, move them to the internal storage of your phone. Step 5. Press the power button to turn off your Mi 4i and Boot into recovery mode. Step 6. Once the phone in recovery mode, do a Wipe cache, data and perform a factory reset. Don’t wipe the internal storage, otherwise you will lost the ROM and Google apps package. Step 7. Now go to ‘Install’ and select the MIUI 7 ROM to flash. Step 8. Once the ROM is flashed, do the same thing with Google Apps. Step 9. Now go back to the main menu of recovery and reboot the phone. Now your Mi 4i will reboot and the first boot take 5 to 10 minutes to boot and upgrade. That’s it, now your Mi 4i is running on the MIUI 7.
why MIUI 7 is not available in Updater in Mi 4i phone. in other phone like redmi 2 , it is available in updater in tools.